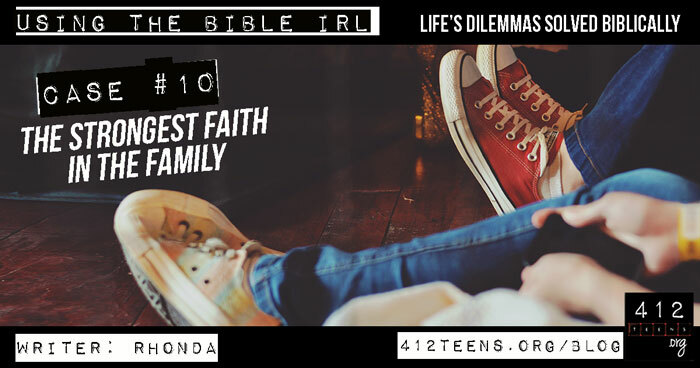 EDITOR'S NOTE: Answering life questions with biblical principles is what we do every day at 412teens. The Bible has answers to just about any question we can think of (2 Timothy 3:16). If there isn't a direct answer, then we have biblical principles to help us find what's best for each of us personally. Add to that the fact that Holy Spirit was sent to help us make good decisions, and we can count ourselves well-equipped to deal with life (John 14:16, 26, 15:26). This blog series gives practical examples of how to use the Bible to solve life's daily problems. Hopefully by seeing these cases, you will begin to understand how the Bible indeed has answers (and we can help you find them). Take note of the Bible references and check them for yourself as you read through Rhonda's answer to the following question. How do I stay strong in my faith when my family members are lukewarm Christians? The short answer: Stay strong with God through your faith even when your family doesn't. At the end of the day, your relationship with God is about your free will and choices and not the responsibility of any other person—even your family members. God did not mistakenly place you in the wrong family. God knows exactly the right place for you to be planted so that you can bloom. The Bible commands us to honor our parents and those placed in authority over us—and there is no clause that says this is only if they are doing all we feel they should do to help us to grow into amazing Christian women and men. While it might make sense that those who are older, who have been Christians longer, who have authority, and, as parents, are commanded to teach us the ways of God, SHOULD be further along the path than are we...that's just not always the case. However, it's OK and even advisable to add some other Christian friends or mentors into your life who are strong in their faith and can help stretch you into greater spiritual maturity. Spiritual maturity is not equivalent to age. All Christians are on a journey toward righteousness, but we are not all in the same place in that journey. The Bible talks about many young people whom God called to do very big tasks. David was a teenager when he did what a whole army could not do—take down a giant (1 Samuel 17). As a teenager, Joseph learned in a dream that he would be a ruler, and his family (all older than him) would one day bow at his feet. Joseph’s jealous brothers sold him into slavery and he faced trial after trial (including jail time for a crime he did not commit) while still very young, yet he continued to grow in his faith in the Lord. (Genesis 37). Samuel was a young boy when God called him to be a priest. Timothy was a very young preacher of Christianity. He was probably no older than late teens/early twenties when he joined Paul, but he had already distinguished himself as faithful to God. It is from Timothy that I think we can learn a lot regarding your present circumstances. Although Timothy did have believing family members who no doubt helped his faith to grow, Timothy was given an immense amount of responsibility at a very young age. In Paul’s first letter to Timothy, he exhorted Timothy not to let others look down upon him due to his youth, but to set an example for other believers “in speech, in conduct, in love, in faith and in purity” (1 Timothy 4:12). Once Timothy became a Christian, his faith was seen by Paul and by God as his own responsibility, not the responsibility of his family. As a young Christian, you are called to study the Bible, pray, grow, and serve God regardless of whether or not your family is. God is entrusting you with the ability to be a witness to your family. Hopefully you will be able to lead members of your family into greater faith, obedience, love, and spiritual maturity by your example. But you know what does not work when trying to lead others to greater faith? Judgment. Ever. In some areas of your walk with God, you may be further along in your journey than some in your family or friend circles. And that’s OK. Lead by example. In some areas of righteousness, some in your family or your friends are further along in their journey than are you. And that’s OK. Learn by their example. When you're feeling discouraged or stunted, ask God to help you stay strong! He has mighty things planned for your life. Many of the challenges He allows into our lives are the people He introduces into them. These challenges and people help us to grow into the godly men and women He created us to be—and that is a good thing! Do you ever feel like you're more serious about your faith than the rest of your family or Christian friends? Do you ever get frustrated that your loved ones aren't further along in their walk with Jesus? Or frustrated that your family doesn’t read the Bible or pray together? Have you felt responsible for the personal faith of a family member? Share your story in the comments below! What if I can't go to church? Should I tell when I see something doing something bad? How do I evangelize without turning people away? Why is it important to spend time alone with God? Rhonda is an author, wife, mother, and mentor. She graduated from the University of Missouri with a degree in English and Religious studies. She loves studying God’s Word for truth and wisdom and uses it as a compass and roadmap for her own spiritual journey. 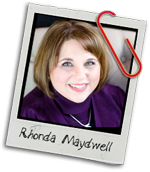 Rhonda believes in sharing the Good News and the hope found in Biblical truths with others. She uses her writing and mentoring opportunities (often with a pinch of humor) to do just that.